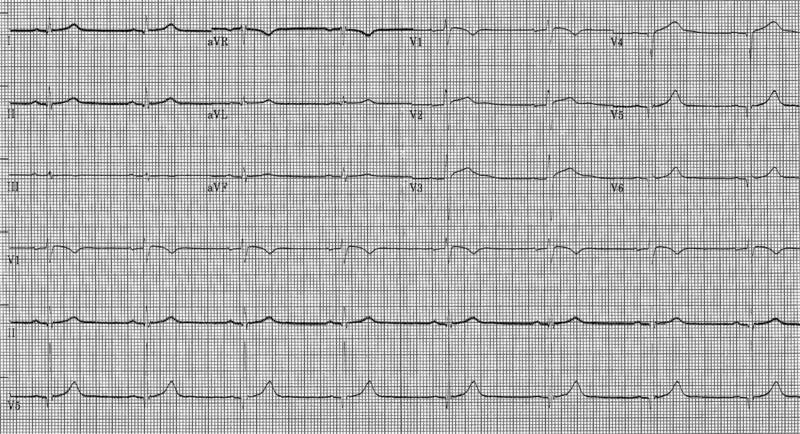 Out-of-hospital electrocardiogram (ECG) shows a sinus rhythm of 85 beats per minute (bpm), narrow QRS complex, and ST-segment elevations in leads V1–V4 (coved morphology in V1–V2), with a terminal negative T wave in V1–V2 (Fig. 1). 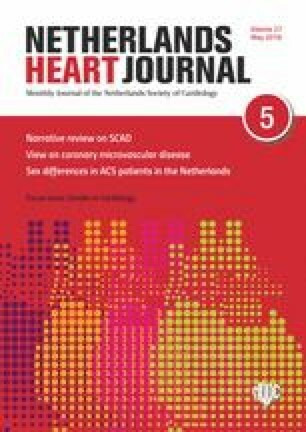 ECG findings could be suspicious for acute anteroseptal myocardial infarction, but reciprocal ST-segment changes are lacking. 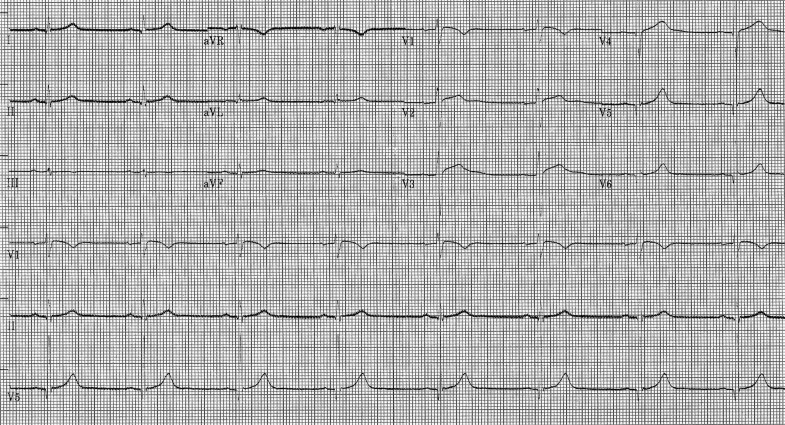 The ECG is also suggestive of a coved-type Brugada-like pattern, and the patient had no history of syncope or any other cardiac symptom, nor a family history of unexplained sudden cardiac death. The patient met criteria for exertional heat stroke , and was admitted to the intensive care unit for rhythm monitoring. Fluid therapy was started, and within the first 2 hours the ECG showed sinus bradycardia of 48 bpm, normalised ST segment, QTc of 430 ms, and prominent U waves in V2–V3 (Fig. 2), remaining with similar features during the hospital stay. Echocardiogram and computed tomography coronary angiography performed before discharge were normal. Diffuse ST-T deviations have been described in patients with heat stroke , but right precordial leads ST elevation suggestive of Brugada pattern in this context is exceptional . Ion channels sensitive to temperature may explain this electrocardiographic finding in susceptible individuals. In the present case, the rapid resolution of ECG abnormalities favours the diagnosis of Brugada-like ECG pattern induced by exertional heat stroke, and a negative ajmaline provocation test reinforces the diagnosis. Type 1 Brugada-like ECG pattern induced by exertional heat stroke. L.E. Lezcano Gort, B. Roque Rodríguez and M.R. Porro Fernández declare that they have no competing interests.